JH Motorsports is preparing for its third official season in the karting business. 2018 was an extremely busy year for JH Motorsports owner Josh Huff, traveling around the country supporting team drivers while also helping to grow the sport in the southern California with support of new and returning racers at the regional and club level. The season also marked the new home for JH Motorsports, as Huff moved his operation into a new 3,400 sq ft. race shop in El Cajon, California. As attention turns to the 2019 season, JH Motorsports is excited to announce its expansion by adding the Kart Republic chassis to its product line. Kart Republic was the fastest growing chassis in the United States and the world in 2018. Industry leader Dino Chiesa, who helped drivers such as Lewis Hamilton and Nico Rosberg during their karting careers, launched the KR brand at the end of 2017. In the process, Chiesa helped Danny Kierle and Lorenzo Travisanutto earn the last two world karting championships. Travisanutto’s title came aboard the Kart Republic chassis, adding to the many victories and titles earned in 2018. Here in the United States, distributor KartSport North America has put the chassis underneath many drivers around the country. The new relationship between JH Motorsports and KartSport North America helps expand the brand to the West Coast, and will provide a great opportunity for both operations. The addition of Kart Republic expands the chassis product line that JH Motorsports already offers. Since its launch, JH Motorsports has provided the VemmeKart chassis to its customers. The full line of VemmeKart chassis is available through JHM, and with it come years of experience working with the brand. Erik Jackson and Chase Gardner won Challenge of the Americas championships in 2018 with assistance from JH Motorsports and the VemmeKart gained tremendous results throughout the east coast in TaG, 100cc and Briggs competition. Completing the chassis line under the JH Motorsports banner is the VLR from RLV-USA Products. Designed around the popular Briggs & Stratton 206 engine, the VLR is among the most popular chassis in Southern California. 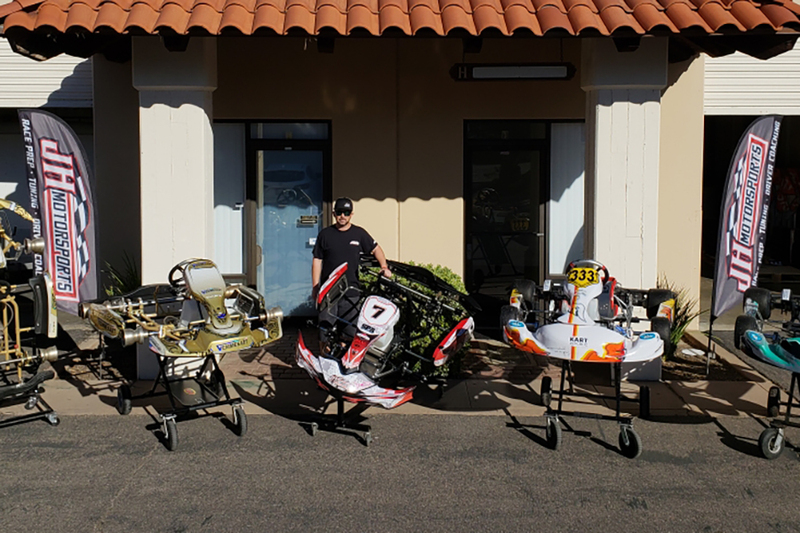 The chassis has gained success, winning at the SKUSA Winter Series, IKF Grand Nationals and, of course, at the local level in Southern California at Los Angeles Karting Championship and Tri-C Karters. JH Motorsports has race-ready packages for new and current racers to jump in and start winning today! 2019 also marks an alignment with another industry member of the sport. JH Motorsports and CB Motorsports will form an alliance throughout the 2019 season. CB Motorsports, led by veteran racer Christian Bird, provides support for racers based in Colorado, and is working alongside JH Motorsports throughout the season, including the upcoming Challenge of the Americas. JH Motorsports has a busy 2019 calendar, focusing its efforts on five programs. The year begins with Challenge of the Americas and sends Huff around the country in support of the SKUSA Pro Tour. In California, JH Motorsports will be trackside at the California ProKart Challenge, Los Angeles Karting Championship and Tri-C Karters events in 2019. Support at the ROK the RIO and SKUSA SuperNationals 23 in Las Vegas will close out the season. Before this year wraps up, check out the SoCal Chill Challenge with Tri-C at Adams Motorsports Park with JH Motorsports on December 29 and January 19, 2019.